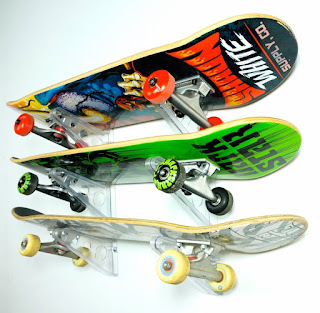 Looking for the best skateboard display rack for all your skateboards? 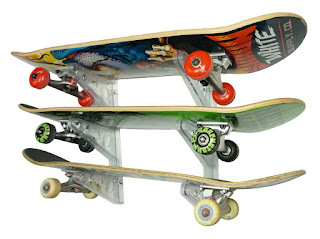 Check out the Clear Triple Skateboard Rack! This rack is super versatile rack - it can hold 3 skateboards plus helmets and backpacks that hang from the rack's arms. The rack arms can be spaced at any length apart to be set up to store your skateboards of any length, including longboard skateboards, and even any other gear you have around like skis, snowboards, or hockey or lacrosse sticks. 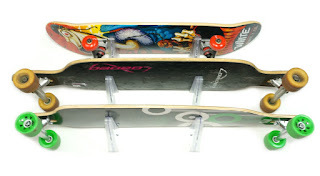 The clear plastic construction on this skateboard rack means all the focus will be on displaying your skateboards because the rack disappears into the background, like it's not even there. Grab one or two of these skateboard racks for your garage, bedroom, basement, mudroom, or anywhere else that you store your skateboards. Made in the USA!